These highlights do not include all the information needed to use DIGOXIN ORAL SOLUTION safely and effectively. See full prescribing information for DIGOXIN ORAL SOLUTION. Geriatric Patients ( 8.5): Use caution during dose selection, taking into account renal function, and carefully monitor for side effects. Renal Impairment ( 8.7): Digoxin is excreted by the kidneys. Renal function should be considered during dosage selection. Pregnant Patients ( 8.1): Digoxin is classified as Pregnancy Category C, it is unknown whether use during pregnancy can cause fetal harm. 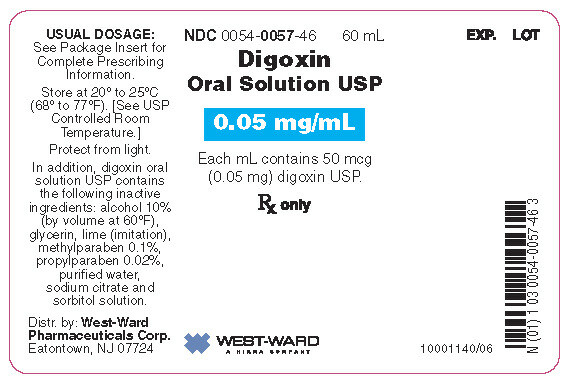 Digoxin Oral Solution USP is indicated for the treatment of mild to moderate heart failure. Digoxin increases left ventricular ejection fraction and improves heart failure symptoms as evidenced by increased exercise capacity and decreased heart failure-related hospitalizations and emergency care, while having no effect on mortality. Where possible, digoxin should be used with a diuretic and an angiotensin-converting enzyme inhibitor, but an optimal order for starting these three drugs cannot be specified. Digoxin is indicated to increase myocardial contractility in pediatric patients with heart failure. Digoxin Oral Solution USP is indicated for the control of resting ventricular response rate in patients with chronic atrial fibrillation. Digoxin should not be used for the treatment of multifocal atrial tachycardia. Dose titration may be accomplished by either of two general approaches that differ in dosage and frequency of administration, but reach the same total amount of digoxin accumulated in the body. If rapid titration is considered medically appropriate, administer a loading dose based upon projected peak digoxin body stores. Maintenance dose can be calculated as a percentage of the loading dose. More gradual titration may be obtained by beginning an appropriate maintenance dose, thus allowing digoxin body stores to accumulate slowly. Steady-state serum digoxin concentrations will be achieved in approximately five half-lives of the drug for the individual patient. Depending upon the patient’s renal function, this will take between 1 and 3 weeks. In general, the dose of digoxin used should be determined on clinical grounds. However, measurement of serum digoxin concentrations can be helpful to the clinician in determining the adequacy of digoxin therapy and in assigning certain probabilities to the likelihood of digoxin intoxication. Studies have shown diminished efficacy at serum levels < 0.5 ng/mL, while levels above 2 ng/mL are associated with increased toxicity without increased benefit. The inotropic effects of digoxin tend to appear at lower concentrations than the electrophysiological effects. Based on retrospective analysis, adverse events may be higher in the upper therapeutic range. Perform sampling of serum concentrations just before the next scheduled dose of the drug. If this is not possible, sample at least 6 hours or later after the last dose, regardless of the route of administration or the formulation used. On a once-daily dosing schedule, the concentration of digoxin will be 10% to 25% lower when sampled at 24 versus 8 hours, depending upon the patient’s renal function. On a twice-daily dosing schedule, there will be only minor differences in serum digoxin concentrations whether sampling is done at 8 or 12 hours after a dose. The serum concentration of digoxin should always be interpreted in the overall clinical context, and an isolated measurement should not be used alone as the basis for increasing or decreasing the dose of the drug. When decision-making is to be guided by serum digoxin levels, the clinician must consider the possibility of reported concentrations that have been falsely elevated by endogenous digoxin-like immunoreactive substances [see Drug Interactions (7.4)]. If the assay being used is sensitive to these substances, it may be prudent to obtain a baseline measurement before digoxin therapy is started, and correct later values by the reported baseline level. Loading doses for each age group are given in Table 1 below. In pediatric patients, if a loading dose is needed, it can be administered with roughly half the total given as the first dose. Additional fractions of this planned total dose may be given at 4- to 8-hour intervals, with careful assessment of clinical response before each additional dose. If the patient’s clinical response necessitates a change from the calculated loading dose of digoxin, then calculation of the maintenance dose should be based upon the amount actually given as the loading dose [see Table 1 and 2]. More gradual attainment of digoxin levels can also be accomplished by beginning an appropriate maintenance dose. The range of percentages provided in Table 2 (2.4 Estimate of Daily Maintenance Dose) can be used in calculating this dose for patients with normal renal function. Steady state will be attained after approximately 5 days in subjects with normal renal function. The recommended daily maintenance doses for each age group are given in Table 2 below. These recommendations assume the presence of normal renal function. Dosage guidelines provided are based upon average patient response and substantial individual variation can be expected. Accordingly, dosage selection must be based upon clinical assessment and ultimately therapeutic drug level monitoring of the patient. Divided daily dosing is recommended for pediatric patients under age 10. In the newborn period, renal clearance of digoxin is diminished and suitable dosage adjustments must be made as shown in Tables 1 and 2. Renal clearance is further reduced in the premature infant. Beyond the immediate newborn period, pediatric patients generally require proportionally larger doses than adults on the basis of body weight or body surface area. Pediatric patients over 10 years of age require adult dosages in proportion to their body weight. Some researchers have suggested that infants and young pediatric patients tolerate slightly higher serum concentrations than do adults. For pediatric patients with known or suspected renal dysfunction, lower starting doses should be considered combined with frequent monitoring of digoxin levels. NOTE: The calibrated oral syringe supplied with the 60 mL bottle of digoxin oral solution is not appropriate to measure doses below 0.1 mL. Doses less than 0.1 mL require appropriate methods or measuring devices designed to administer an accurate amount to the patient. The body’s handling of digoxin can be affected by many different patient-specific factors. Some of the possible effects are small, so anticipatory dose adjustment might not be required, but others should be considered before initial dosing [see Clinical Pharmacology (12.2) and Drug Interactions (7)]. Both adults and pediatric patients with abnormal renal function need to have the dose of digoxin proportionally reduced. Recommended maintenance doses based upon lean body weight and renal function are listed in Table 3. Developmental changes in pediatric renal function were factored into Table 3. However, age-related and other changes in adult renal function were not. The volume of distribution of digoxin is proportional to lean body weight and doses listed in Table 3 assume average body composition. The dose of digoxin must be reduced in patients whose lean weight is an abnormally small fraction of their total body mass because of obesity or edema. The doses are rounded to whole numbers. Twice daily dosing is recommended for pediatric patients under 10 years of age. Once daily dosing is recommended for pediatric patients above 10 years of age and adults. Ccr is creatinine clearance, corrected to 70 kg body weight or 1.73 m 2 body surface area. For adults, if only serum creatinine concentrations (Scr) are available, a Ccr (corrected to 70 kg body weight) may be estimated in men as (140 – Age)/Scr. For women, this result should be multiplied by 0.85. Note: This equation cannot be used for estimating creatinine clearance in infants or pediatric patients. For pediatric patients, the modified Schwartz equation may be used as listed below. The formula was based on height in cm and Scr in mg/dL where k is a constant. Ccr is corrected to 1.73 m 2 body surface area. During the first year of life, the value of k is 0.33 for pre-term babies and 0.45 for term infants. The k is 0.55 for pediatric patients and adolescent girls and 0.7 for adolescent boys. GFR (mL/min/1.73 m 2) = (k x Height)/Scr. Determination of the target dose in milliliters of Digoxin Oral Solution based on body weight is shown in Table 4. Provided is the volume required per dose, NOT per day. a Recommended dosing regimen for pediatric patients under 10 years of age is twice daily. Recommended dosing regimen for pediatric patients over 10 years of age and adults is once daily. b Use calibrated oral syringe for measurement. In the case of required volume less than 0.1 mL, a separate device is recommended for adequate measurement. On the left side of the chart, locate the patient’s weight in kilograms. At the top of the chart, identify which dose in mcg/kg will be used for this patient. The block on the chart at which the two rows (weight and target dose) intersect is the milliliter amount that should be given to the patient. changes in renal function [see Table 3: Usual Maintenance Dose Requirements (mcg) of Digoxin above]. Each 1 mL of clear, colorless Digoxin Oral Solution USP contains 0.05 mg (50 mcg). The Digoxin Oral Solution bottles are to be used with the graduated oral syringes provided in the carton. Starting at 0.1 mL, this 1 mL oral syringe is marked in divisions of 0.1 mL, corresponding to 5 mcg or 0.005 mg of digoxin. Allergy to digoxin is rare. Digoxin is contraindicated in patients with a known hypersensitivity to digoxin or other forms of digitalis. Digitalis glycosides, such as digoxin, are contraindicated in ventricular fibrillation. Because digoxin slows sinoatrial and AV conduction, the drug commonly prolongs the PR interval. Digoxin may cause severe sinus bradycardia or sinoatrial block particularly in patients with pre-existing sinus node disease and may cause advanced or complete heart block in patients with pre-existing incomplete AV block. In such patients consideration should be given to the insertion of a pacemaker before treatment with digoxin. Some signs and symptoms (anorexia, nausea, vomiting, and certain arrhythmias) can equally result from digoxin toxicity as from congestive heart failure. Misidentification of their etiology might lead the clinician to continue or increase digoxin dosing, when dosing should actually be suspended. When the etiology of these signs and symptoms is not obvious, measurement of serum digoxin levels may be helpful. Patients with certain disorders involving heart failure associated with preserved left ventricular ejection fraction may not benefit from digoxin treatment and may be particularly susceptible to adverse reactions when they are treated with digoxin. In patients with hypertrophic cardiomyopathy (formerly called idiopathic hypertrophic subaortic stenosis), the positive inotropic effect of digoxin leads to an increased subvalvular outflow gradient and therefore, may compromise cardiac output. Digoxin is rarely beneficial in patients with this condition. Chronic constrictive pericarditis is not generally associated with any inotropic defect, so heart failure of this etiology is unlikely to respond to treatment with digoxin. By slowing the resting heart rate, digoxin may actually decrease cardiac output in these patients. Digoxin as an inotropic agent is of limited value in patients with restrictive cardiomyopathies, although it has been used for ventricular rate control in the subgroup of patients with atrial fibrillation. In addition, patients with amyloid heart disease may be more susceptible to toxicity from digoxin at therapeutic levels because of an increased binding of digoxin to extracellular amyloid fibrils. Digoxin is primarily excreted by the kidneys; therefore, patients with impaired renal function require smaller than usual maintenance doses of digoxin [see Dosage and Administration (2.4). Because of the prolonged elimination half-life, a longer period of time is required to achieve an initial or new steady-state serum concentration in patients with renal impairment than in patients with normal renal function. If appropriate care is not taken to reduce the dose of digoxin, such patients are at high risk for toxicity, and toxic effects will last longer in such patients than in patients with normal renal function. In patients with hypokalemia or hypomagnesemia, toxicity may occur at concentrations within therapeutic range because potassium or magnesium depletion sensitizes the myocardium to digoxin. Therefore, it is desirable to maintain normal serum potassium and magnesium concentrations in patients being treated with digoxin. Serum potassium levels should be carefully monitored when digoxin is given to patients at high risk of hypokalemia (e.g., those receiving diuretics, corticosteroids, or other drugs that commonly lead to potassium loss; those with gastrointestinal losses through diarrhea, vomiting, or nasogastric suction; or those with potassium-losing endocrinopathies or nephropathies). Digoxin toxicity is also more likely in the presence of hypomagnesemia. Hypomagnesemia is common in most of the same conditions in which hypokalemia appears. Most notably, it is commonly seen in alcoholics and in patients with diabetes mellitus or hypercalcemia. Because digoxin’s therapeutic and toxic effects are all largely mediated by intracellular calcium distribution, they are affected by abnormalities in serum calcium levels. Hypercalcemia increases the risk of digoxin toxicity, while digoxin may be therapeutically ineffective in the presence of hypocalcemia. Reduction of digoxin dosage may be desirable prior to electrical cardioversion to avoid induction of ventricular arrhythmias, but the physician must consider the consequences of a rapid increase in ventricular response to atrial fibrillation if digoxin is withheld 1 to 2 days prior to cardioversion. If there is a suspicion that digitalis toxicity exists, elective cardioversion should be delayed. If it is not prudent to delay cardioversion, the energy level selected should be minimal at first and carefully increased in an attempt to avoid precipitating ventricular arrhythmias. Hypothyroidism may reduce the requirements for digoxin. Heart failure and atrial arrhythmias resulting from hypermetabolic or hyperdynamic states (e.g., hyperthyroidism, hypoxia, or arteriovenous shunt) are best treated by addressing the underlying condition. Atrial arrhythmias associated with hypermetabolic states (e.g., hyperthyroidism) are particularly resistant to digoxin treatment. Large doses of digoxin are not recommended as the only treatment of these arrhythmias and care must be taken to avoid toxicity if large doses of digoxin are required. In hypothyroidism, the digoxin requirements are reduced. Digoxin responses are normal in patients with compensated thyroid disease. In patients with acute myocardial infarction, particularly if they have ongoing ischemia, the use of inotropic drugs, such as digoxin, may result in undesirable increases in myocardial oxygen demand and ischemia. Moreover, the use of digoxin may result in potentially detrimental increases in coronary vascular resistance mediated through alpha adrenergic receptor stimulation. Digoxin can precipitate vasoconstriction and may promote production of pro-inflammatory cytokines. Therefore, avoid digoxin in patients with myocarditis. The use of therapeutic doses of digoxin may cause prolongation of the PR interval and depression of the ST segment on the electrocardiogram. Digoxin may produce false positive ST-T changes on the electrocardiogram during exercise testing that may be indistinguishable from those of ischemia. These electrophysiologic effects reflect an expected effect of the drug and are not indicative of toxicity. Digoxin does not significantly decrease heart rate during exercise. Patients receiving digoxin should have their serum electrolytes and renal function (serum creatinine concentrations) assessed periodically; the frequency of assessments will depend on the clinical setting. Assays of serum digoxin levels are described elsewhere [see Drug Interactions (7.4)], as is their use in patient monitoring [see Dosage and Administration (2.2)]. The frequency and severity of adverse reactions to digoxin when taken orally depend on the dose and the patient's underlying disease or concomitant therapies [see Warnings and Precautions (5) and Drug Interactions (7)] . The overall incidence of adverse reactions has been reported as 5% to 20%, with 15% to 20% of them being considered serious (1% to 4% of patients receiving digoxin). Evidence suggests that the incidence of toxicity has decreased since the introduction of the serum digoxin assay and improved standardization of digoxin tablets. Cardiac toxicity accounts for about one-half, gastrointestinal disturbances for about one-fourth, and CNS and other toxicity for about one-fourth of these adverse reactions. Adverse reactions are less common when digoxin is used within the recommended dose range or therapeutic serum concentration range and when there is careful attention to concurrent medications and conditions. In adults, high doses of digoxin may produce a variety of electrocardiographic changes and rhythm disturbances, such as first-degree, second-degree (Wenckebach), or third-degree heart block (including asystole); atrial tachycardia with block; AV dissociation; accelerated junctional (nodal) rhythm; unifocal or multifocal ventricular premature contractions (especially bigeminy or trigeminy); ventricular tachycardia; and ventricular fibrillation. Prophylactic use of a cardiac pacemaker may be considered if the risk of heart block is considered unacceptable. In pediatric patients, the use of digoxin may produce arrhythmias. The most common are conduction disturbances or supraventricular tachycarrhythmias, such as atrial tachycardia (with or without block) and junctional (nodal) tachycardia. Ventricular arrhythmias are less common. Sinus bradycardia may be a sign of impending digoxin intoxication, especially in infants, even in the absence of first-degree heart block. Any arrhythmias or alteration in cardiac conduction that develops in a child taking digoxin should initially be assumed to be a consequence of digoxin intoxication. Anorexia, nausea, vomiting and diarrhea may be early symptoms of digoxin toxicity. However, uncontrolled heart failure may also produce such symptoms. The use of digoxin has been associated with abdominal pain, intestinal ischemia, and hemorrhagic necrosis of the intestines. Digoxin can produce visual disturbances (blurred vision, green-yellow color disturbances, halo effect), headache, weakness, dizziness, apathy, confusion, and mental disturbances (such as anxiety, depression, delirium, and hallucination). Gynecomastia has been reported following the prolonged use of digoxin. Thrombocytopenia, maculopapular rash and other skin reactions have been observed. Digoxin is a substrate for P-glycoprotein, at the level of intestinal absorption, renal tubular section and biliary-intestinal secretion. Therefore, drugs that induce/inhibit P-glycoprotein have the potential to alter digoxin pharmacokinetics. Measure serum digoxin concentrations before initiating concomitant drugs. Reduce digoxin dose by approximately 30% to 50% or by modifying the dosing frequency and continue monitoring. Measure serum digoxin concentrations before initiating concomitant drugs. Reduce digoxin dose by approximately 15% to 30% or by modifying the dosing frequency and continue monitoring. Measure serum digoxin concentrations before initiating concomitant drugs. Continue monitoring and increase digoxin dose by approximately 20% to 40% as necessary. Additive effects on AV node conduction can result in complete heart block. Ivabradine can increase the risk of bradycardia. Endogenous substances of unknown composition (digoxin-like immunoreactive substances, DLIS) can interfere with standard radioimmunoassays for digoxin. The interference most often causes results to be falsely positive or falsely elevated, but sometimes it causes results to be falsely reduced. Some assays are more subject to these failings than others. Several LC/MS/MS methods are available that may provide less susceptibility to DLIS interference. DLIS are present in up to half of all neonates and in varying percentages of pregnant women, patients with hypertrophic cardiomyopathy, patients with renal or hepatic dysfunction, and other patients who are volume-expanded for any reason. The measured levels of DLIS (as digoxin equivalents) are usually low (0.2 to 0.4 ng/mL), but sometimes they reach levels that would be considered therapeutic or even toxic. In some assays, spironolactone, canrenone and potassium canrenoate may be falsely detected as digoxin, at levels up to 0.5 ng/mL. Some traditional Chinese and Ayurvedic medicine substances like Chan Su, Siberian Ginseng, Asian Ginseng, Ashwagandha or Dashen, can cause similar interference. Spironolactone and DLIS are much more extensively protein-bound than digoxin. As a result, assays of free digoxin levels in protein-free ultrafiltrate (which tend to be about 25% less than total levels, consistent with the usual extent of protein binding) are less affected by spironolactone or DLIS. It should be noted that ultrafiltration does not solve all interference problems with alternative medicines. The use of an LC/MS/MS method may be the better option according to the good results it provides, especially in term of specificity and limit of quantization. Animal reproduction studies have not been conducted with digoxin. It is also not known whether digoxin can cause fetal harm when administered to pregnant women or can affect reproductive capacity. Digoxin should be given to a pregnant woman only if clearly needed. There is not enough data from clinical trials to determine the safety and efficacy of digoxin during labor and delivery. Digoxin levels in human milk are lower than those in maternal serum. The estimated exposure that a nursing infant would be expected to receive via breastfeeding would be far below the usual infant maintenance dose. Therefore, this amount should have no pharmacologic effect upon the infant. Nevertheless, caution should be exercised when digoxin is administered to a nursing woman. Digoxin increases myocardial contractility in pediatric patients with congestive heart failure. There are no clinical efficacy studies demonstrating benefit in pediatric patients with heart failure. There are no controlled randomized studies of digoxin in pediatric patients with atrial tachyarrhythmias [see Clinical Studies (14.2)]. The majority of clinical experience gained with digoxin has been in the elderly population. This experience has not identified differences in response or adverse effects between the elderly and younger patients. However, this drug is known to be substantially excreted by the kidney, and the risk of toxic reactions to this drug may be greater in patients with impaired renal function. Because elderly patients are more likely to have decreased renal function, care should be taken in dose selection, which should be based on renal function, and it may be useful to monitor renal function [see Dosage and Administration (2.4)]. No clinically significant gender differences in digoxin pharmacokinetics have been reported. The clearance of digoxin can be primarily correlated with renal function as indicated by creatinine clearance. Table 3 provides the usual daily maintenance dose requirements of solution based on creatinine clearance (per 70 kg or per 1.73 m2) [see Dosage and Administration (2.4)]. For pediatric patients with known or suspected renal dysfunction, lower starting doses should be considered combined with frequent monitoring of digoxin levels. In hyperthyroidism, lower serum digoxin concentrations have been reported because of decreased absorption. Hypothyroid patients may require smaller doses of digoxin. Race differences in digoxin pharmacokinetics have not been formally studied, but are not expected. In adults, the signs and symptoms of toxicity are similar to those described in Adverse Reactions (6) but may be more frequent and severe. The most common signs and symptoms of digoxin toxicity are nausea, vomiting, anorexia, and fatigue that occur in 30% to 70% of patients who are overdosed. Extremely high serum concentrations produce hyperkalemia especially in patients with impaired renal function. Almost every type of cardiac arrhythmia has been associated with digoxin overdose and multiple rhythm disturbances in the same patient are common. Peak cardiac effects occur 3 to 6 hours following ingestion and may persist for 24 hours or longer. Arrhythmias that are considered more characteristic of digoxin toxicity are new-onset Mobitz type 1 A-V block, accelerated junctional rhythms, non-paroxysmal atrial tachycardia with A-V block, and bi-directional ventricular tachycardia. Cardiac arrest from asystole or ventricular fibrillation is usually fatal. Digoxin toxicity is related to serum concentration. As serum levels increase above 1.2 ng/mL, there is a potential for increase in adverse events. The effect on adverse events is enhanced by lower potassium levels. In adults with heart disease, clinical observations suggest that an overdose of digoxin of 10 to 15 mg results in death of half of patients. A dose above 25 mg ingested by an adult without heart disease appeared to be uniformly fatal if no Digoxin Immune Fab (DIGIBIND®, DIGIFAB®) was administered. In pediatric patients, signs and symptoms of toxicity can occur during or shortly after the dose of digoxin. Frequent non-cardiac effects are similar to those observed in adults although nausea and vomiting are not seen frequently in infants and small pediatric patients. Other reported manifestations of overdose are weight loss in older age groups, failure to thrive in infants, abdominal pain caused by mesenteric artery ischemia, drowsiness, and behavioral disturbances including psychotic episodes. Arrhythmias and combinations of arrhythmias that occur in adult patients can also occur in pediatric patients although sinus tachycardia, supraventricular tachycardia, and rapid atrial fibrillation are seen less frequently in pediatric patients. Pediatric patients are more likely to develop A-V conduction disturbances, or sinus bradycardia. Any arrhythmia in a child treated with digoxin should be considered related to digoxin until otherwise ruled out. In pediatric patients aged 1 to 3 years without heart disease, clinical observations suggest that an overdose of digoxin of 6 to 10 mg would result in death of half of the patients. In the same population, a dose above 10 mg resulted in death if no Digoxin Immune Fab (DIGIBIND®, DIGIFAB®) was administered. If there is suspicion of toxicity, digoxin should be discontinued and the patient placed on a cardiac monitor. Contributing factors such as electrolyte abnormalities, thyroid dysfunction, and concomitant medications should be corrected [see Dosage and Administration (2.5)]. Hypokalemia should be corrected by administering potassium so that serum potassium is maintained between 4.0 and 5.5 mmol/L. Potassium is usually administered orally, but when correction of the arrhythmia is urgent and serum potassium concentration is low, potassium may be administered cautiously by the intravenous route. The electrocardiogram should be monitored for any evidence of potassium toxicity (e.g. peaking of T waves) and to observe the effect on the arrhythmia. Potassium salts should be avoided in patients with bradycardia or heart block. Symptomatic arrhythmias may be treated with Digoxin Immune Fab (DIGIBIND®, DIGIFAB®). Patients who have intentionally or accidently ingested massive doses of digoxin should receive activated charcoal orally or by nasogastric tube regardless of the time since ingestion since digoxin recirculates to the intestine by enterohepatic circulation. In addition to cardiac monitoring, digoxin should be temporarily discontinued until the adverse reaction resolves. Factors that may be contributing to the adverse reactions should also be corrected [seeWarnings and Precautions (5)]. In particular, hypokalemia and hypomagnesemia should be corrected. Digoxin is not effectively removed from the body by dialysis because of its large extravascular volume of distribution. Life threatening arrhythmias (ventricular tachycardia, ventricular fibrillation, high degree A-V block, bradyarrhythma, sinus arrest) or hyperkalemia requires administration of Digoxin Immune Fab (DIGIBIND®, DIGIFAB®). Digoxin Immune Fab has been shown to be 80% to 90% effective in reversing signs and symptoms of digoxin toxicity. Bradycardia and heart block caused by digoxin are parasympathetically mediated and respond to atropine. A temporary cardiac pacemaker may also be used. Ventricular arrhythmias may respond to lidocaine or phenytoin. When a large amount of digoxin has been ingested, especially in patients with impaired renal function, hyperkalemia may be present due to release of potassium from skeletal muscle. In this case, treatment with Digoxin Immune Fab (DIGIBIND®, DIGIFAB®) is indicated; an initial treatment with glucose and insulin may be needed if the hyperkalemia is life-threatening. Once the adverse reaction has resolved, therapy with digoxin may be reinstituted following a careful reassessment of dose. Its molecular formula is C41H64O14, and its molecular weight is 780.95. Digoxin is practically insoluble in water and in ether, slightly soluble in 50% ethanol and in chloroform, and freely soluble in pyridine. Digoxin USP is a white or almost white powder, or colorless crystals. Digoxin Oral Solution USP is formulated for oral administration. Each mL contains 50 mcg (0.05 mg digoxin). The lime-flavored solution contains the following inactive ingredients: alcohol 10% (by volume at 60°F), glycerin, lime (imitation), methylparaben 0.1%, propylparaben 0.02%, purified water, sodium citrate and sorbitol solution. The cardiologic consequences of these direct and indirect effects are an increase in the force and velocity of myocardial systolic contraction (positive inotropic action), a slowing of the heart rate (negative chronotropic effect), and decreased conduction velocity through the AV node, and a decrease in the degree of activation of the sympathetic nervous system and renin-angiotensin system (neurohormonal deactivating effect). Short- and long-term treatment with digoxin slows heart rate, increases cardiac output and lowers pulmonary artery pressure, pulmonary capillary wedge pressure, and systemic vascular resistance. These hemodynamic effects are accompanied by an increase in the left ventricular ejection fraction and a decrease in end-systolic and end-diastolic dimensions. Following oral administration, peak serum concentrations of digoxin occur at 30 to 90 minutes. In pediatric patients and in adult volunteers, absolute bioavailability of digoxin from the solution formulation is 70% to 85%, similar to that seen (in adults) with standard tablets (60% to 80%). When the solution is taken after meals, the peak serum concentrations increase by 20% and the total amount of digoxin absorbed increases by 43%, but the rate of digoxin absorption is unchanged. When taken with meals high in bran fiber, however, the amount absorbed from an oral dose may be reduced. Digoxin absorption may also be affected by various concomitant therapy modulating gastric pH and P-glycoprotein [see Drug Interactions (7)]. Comparisons of the systemic availability and equivalent doses for preparations of digoxin are shown in Table 5. For example, 125 mcg tablets equivalent to 125 mcg solution equivalent to 100 mcg capsules equivalent to 100 mcg injection/IV. In some patients, orally administered digoxin is converted to inactive reduction products (e.g., dihydrodigoxin) by colonic bacteria in the gut. Data suggested that one in ten patients treated with digoxin will degrade 40% or more of the ingested dose. As a result, certain antibiotics may increase the absorption of digoxin in such patients. The magnitude of rise in serum digoxin concentration relates to the extent of bacterial inactivation, and may be as much as two-fold in some cases. Following drug administration, a 6- to 8-hour tissue distribution phase is observed. This is followed by a much more gradual decline in the serum concentration of the drug, which is dependent on the elimination of digoxin from the body. Clinical evidence indicates that the early high serum concentrations do not reflect the concentration of digoxin at its sites of action, but that with chronic use, the steady-state post-distribution serum concentrations are in equilibrium with tissue concentrations and correlate with pharmacologic effects. In individual patients, these post-distribution serum concentrations may be useful in evaluating therapeutic and toxic effects [see Dosage and Administration (2.2)]. Digoxin is concentrated in tissues and therefore has a large apparent volume of distribution. 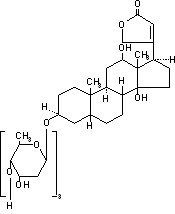 Digoxin crosses both the blood-brain barrier and the placenta. At delivery, the serum digoxin concentration in the newborn is similar to the serum concentration in the mother. Approximately 25% of digoxin in the plasma is bound to protein. Serum digoxin concentrations are not significantly altered by large changes in fat tissue weight, so that its distribution space correlates with lean (i.e., ideal) body weight, not total body weight. Sixteen percent of digoxin is metabolized. The end metabolites include 3-β-digoxigenin, 3-keto-digoxigenin, and their glucuronide and sulfate conjugates. The metabolism of digoxin is not dependent on the cytochrome P-450 system, and digoxin is not known to induce or inhibit the cytochrome P-450 system. Elimination of digoxin is predominantly renal, although in adult volunteers about a quarter of serum digoxin is eliminated through the intestine, excreted in bile or secreted directly into the lumen by P-glycoprotein. Elimination of digoxin follows first order kinetics. Following intravenous administration to healthy volunteers, 50% to 70% of a digoxin dose is excreted unchanged in the urine. Renal excretion of digoxin is proportional to glomerular filtration rate. The serum half-life of digoxin in pediatric patients is reported to be 18 to 36 hours, and in adults it is typically 36 to 48 hours. The half-life in anuric patients is prolonged to 3.5 to 5 days. Digoxin is not effectively removed from the body by dialysis, exchange transfusion, or cardiopulmonary bypass because most of the drug is bound to tissue. Two small 12-week, double-blind, randomized trials compared digoxin to placebo in adult patients with chronic congestive heart failure, New York Heart Association Class II or III. The enrolled patients had all been receiving digoxin before the trials, but this was withdrawn before randomization. They continued to receive diuretics and (in the larger trial) ACE inhibitors. The trials enrolled 178 and 88 patients, respectively. In each of these trials, randomization to digoxin was associated with better preservation of exercise capacity and with reduced need of failure-related hospitalization, emergency care, and concomitant heart-failure therapy. NYHA class and patients' global assessments were also improved, although this effect achieved statistical significance only in the larger of the two studies. The Digitalis Investigation Group (DIG) main trial was a 37-week, multicenter, randomized, double-blind mortality study comparing digoxin to placebo in 6800 adult patients with heart failure and left ventricular ejection fraction ≤0.45. At randomization, 67% were NYHA class I or II, 71% had heart failure of ischemic etiology, 44% had been receiving digoxin, and most were receiving a concomitant ACE inhibitor (94%) and diuretics (82%). As in the smaller trials described above, patients who had been receiving open-label digoxin were withdrawn from this treatment before randomization. Randomization to digoxin was again associated with a significant reduction in the incidence of hospitalization, whether scored as number of hospitalizations for heart failure (relative risk 75%), risk of having at least one such hospitalization during the trial (RR 72%), or number of hospitalizations for any cause (RR 94%). On the other hand, randomization to digoxin had no apparent effect on mortality (RR 99%, with confidence limits of 91% to 107%). No controlled randomized study of digoxin in pediatric patients with atrial tachyarrhythmias has been done. There are no reports of controlled trials of digoxin for conversion of atrial flutter, rate control during atrial flutter, or reduction of the frequency of recurrence of atrial flutter in adults. There are no reports of controlled trials of digoxin for conversion of supraventricular tachycardia (SVT), rate control during SVT, or reduction of the frequency of recurrence of SVT in adults. 0.05 mg (50 mcg) per 1 mL is supplied as a (lime-flavored) clear, colorless solution. Patients receiving digoxin should be given the following instructions by the physician. Advise patients that digoxin is used to treat heart failure and heart arrhythmias. Digoxin helps the heart beat more efficiently in adults and pediatric patients and decreases the heart rate at rest during abnormal rhythms in adults. Instruct patients to take this medication as directed. The dose of digoxin should not be adjusted without consulting with a physician or other healthcare professional. Advise patients that many drugs can interact with digoxin. Patients should be instructed to inform their doctor and pharmacist if they are taking any over the counter medications, including herbal medication, or are started on a new prescription. The patient should be made aware that blood tests will be necessary to ensure that their digoxin dose is appropriate for them. Instruct patients to use the calibrated oral syringe to measure their digoxin dose and to avoid less precise measuring tools, such as teaspoons. For doses less than 0.1 mL, provide another measuring syringe to the patient for accurate dosing, since the provided calibrated oral syringe is not appropriate to measure doses less than 0.1 mL. Instruct women of childbearing potential who become or are planning to become pregnant to consult a physician prior to initiation or continuing therapy with digoxin. Always use the oral syringe provided with your Digoxin Oral Solution to make sure you measure the right amount. Measure the dose of medicine from the widest part of the plunger. Do not measure from the narrow tip. See figure 1. 1. Insert the tip of the oral syringe into the medicine bottle. 2. Pull back the plunger to the line that matches the dose prescribed by your healthcare provider. 3. Remove the oral syringe from the medicine bottle. 4. Take your medicine by slowly pushing the plunger until the oral syringe is empty.